Several economic factors will lead to higher sales this holiday season. Michael Haydock, IBM Fellow and global services lead for consumer analytics, attributes the rise to higher employment rates and stronger consumer confidence. This holiday season, online sales will increase 12.8% compared with last year, while in-store shopping is estimated to decline by 2.5%, Haydock forecasts. One indicator for the strength of online and offline sales is the market volatility of the S&P 500. "There's a security that gets traded called VIX," he said. "Today it's the lowest I've seen in in the 26 years that I've been tracking it,"
Calm markets mean confidence. A volatile VIX means that people will begin to tighten their wallets, he said. The savings as a percent of disposable income continues to decline. People are saving less and spending more. The saving rate on average declined from around 7.15% about two years ago to 3.6% today. Haydock expects a percentage of 3.1% by the end of the year, down from 6% in 2015. "My forecast for unemployment during the next two years is a smidge above 4%," he said. "We think of 5% being a full economy, so this is very close." Consumer behavior continues to drive these shopping trends. Rather than browsing catalogs and malls for the latest fashions, consumers are wading through social media posts and searching on engines. 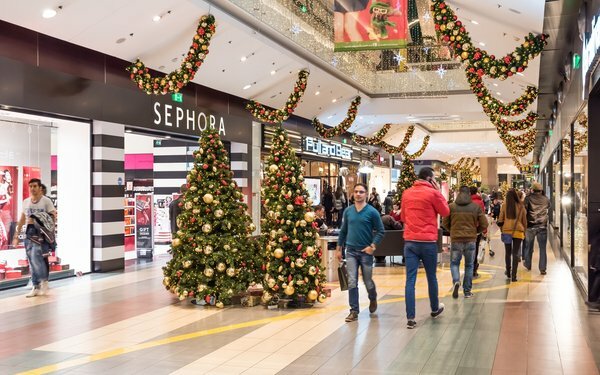 Stable markets, more disposable income, and consumers saving less create "a perfect storm" for retailers to have a good holiday season, Haydock said. When asked whether the political climate is leading to consumers spending more, he said "consumers feel comfortable enough not to save and they're making some big moves in several categories." Men's clothing and home improvement stores will benefit the most this holiday season. Menswear is expected to increase a staggering 8.36%. The real estate market is adding fuel to the home furnishing category with a projected 4.4% increase, not to mention an 8% increase in building materials. Pharmacy sales are expected to rise by 4%.